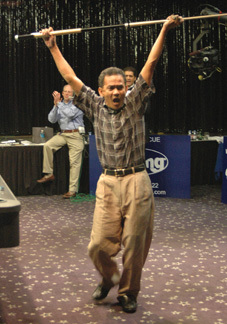 2005 Skins Billiards Championship . Oct. 22, 2005 . Atlantic City, N.J.
How often does one play one game for $54,000? Santos Sambajon found himself in position for that massive payday twice in one hour. And the first time, he blew it on a heart-stopping fluke scratch. The Skins Billiards Championship format was designed to generate sweat-inducing runouts and cliffhanger endings. In fact, the format was so confusing that the big winner - 100-pound titan Sambajon - didn't totally understand the rules. Produced by the Billiards International team also responsible for such made-for-TV fare as Trick Shot Magic, the Skins event tried making pool more of a high-stakes game of chance. Sixteen players each ponied up $5,000 and played in four groups of four, winning fixed amounts for each rack. The top eight moved on to semifinal play, where bigger figures were available to those who could win three racks in a row. The final, fought by four players taking turns at the table, promised $54K alone. While the game's weird rhythms brought out the dog in most of the field, the format brought out the showman in 280-pound Danny Basavich. He made big shows of loosening his neck, rotating his head in giant circles. He mouthed off the cameras. Game wins ignited his signature King Kong roar. It was fantastic TV. Meanwhile, Sambajon took quiet cues from his Filipino countryman Marlon Manalo, who sat in the audience and helped him navigate the format. The final included Corey Deuel and Jose Parica, but only Basavich and Sambajon could win as many as two games in a row. Basavich got close in game three but missed a 3 ball. He threatened again in game 12 for $54,000, but Sambajon rained on his parade with a break-and-run. Then Sambajon had the trifecta in hand, until his cue ball caromed off the 6 and scratched. He threw his head back in anguish, muttering all the way back to his seat. In the end, Sambajon and Basavich lagged for a sudden-death game worth $54,000. Sambajon bested Basavich by an inch. Then he broke and ran out for the win. "Yes! Yes! Yes!" Sambajon screamed, striking triumphant victory poses. Words can't capture the sound of Sambajon and Manalo squealing in their Filipino tongue before lofting a giant cardboard check for $73,500 in total winnings.